It’s self-evident: the less fuel you burn with each kilogram of air, the better the fuel economy you’ll get. Therefore, if you can reduce the amount of fuel going into the engine and still travel at the same speed, you’ll reduce fuel consumption. So why doesn’t everyone reduce the intake of fuel? The answer to that is more complex than it first appears. So what do these ratios indicate? An air/fuel ratio of 12:1 is called rich and results in better power production from the engine than leaner air/fuel ratios. An air/fuel ratio of around 14.7:1 is called stoichiometric; this term indicates that the proportions are chemically correct for best combustion. This air/fuel ratio is used very frequently because, while it is not best for power or economy, the exhaust system’s catalytic converter performs optimally at this air/fuel ratio and therefore harmful exhaust emissions are at their lowest. 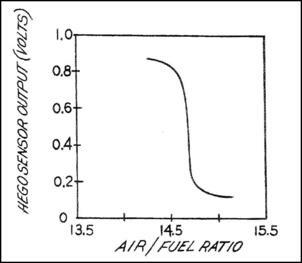 A lean air/fuel ratio might be 16:1, while an ultra lean air/fuel ratio might be as high as 20:1. 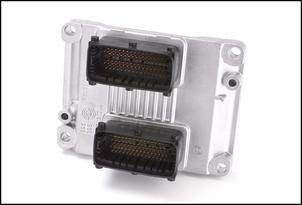 The air/fuel ratio is dictated by the car’s Electronic Control Unit (ECU). In some cars, the air/fuel ratio is fixed at 14.7:1 at all times. In other cars, the air/fuel ratio is at 14.7:1 at idle and in light load and cruise conditions, but richens (eg to 12:1) at high loads. In still other cars, the air/fuel ratio is at 14.7:1 at idle, richens (eg to 12:1) at high loads and goes lean (eg 17:1) in light load cruise. 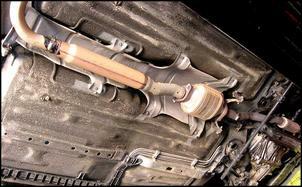 Furthermore, in nearly all cars a rich mixture is used when cold-starting the engine, and until the engine warms up. This might all seem confusing but it’s important to realise that different cars have different air/fuel ratio strategies. The approach chosen by the engineers depends on aspects like the engine’s mechanical design, required emissions, fuel economy and on-road performance. In order that the air/fuel ratio remains accurate while the car is in service, all cars use at least one exhaust gas oxygen sensor. This sensor is normally referred to as an oxygen sensor. By monitoring the voltage output of this sensor, the ECU therefore ‘knows’ whether the air/fuel ratio is richer or leaner than 14.7:1. Normally, the correction the ECU makes to the air/fuel ratio (eg by injecting less or more fuel) slightly overshoots the mark, so another correction then needs to occur in the other direction. The result is that the output of the oxy sensor quickly oscillates up and down, while the average air/fuel ratio remains very close to 14.7:1. When the ECU is using the output of the oxy sensor to check the accuracy of the prevailing air/fuel ratio, the car is said to be in closed loop. In closed loop running, the system can self-learn. So for example, if the fuel pressure regulator is getting a bit sick and fuel pressure is lower than it should be, less fuel will be injected. As a result, the air/fuel ratio will be leaner than the target figure. The ECU, monitoring the output of the oxygen sensor, will recognise this and so increase the amount of fuel the injectors flow (that is, the ECU will open the injectors longer). Two types of self-learning are normally present – short-term and long-term. These are sometimes referred to as ‘trims’. As the names suggest, short-term learning is designed to improve the accuracy of the air/fuel ratio over short periods - for example, because of an individual engine’s differences in gas-flow. Long-term learning compensates for changing aspects like the failing fuel pressure regulator mentioned above, or decreased volumetric efficiency through wearing rings, etc. In some cars, the ECU at times ignores the output of the oxy sensor. This type of operation is called open loop. For example, we described above a car that used an air/fuel ratio of 14.7:1 at idle and in light load and cruise conditions, but richened (eg to 12:1) at high loads. Typically, this car would be in closed loop (ie the ECU watching the feedback of the oxy sensor) all times except at high loads, where the ECU would inject fuel just according to its internal mapping. 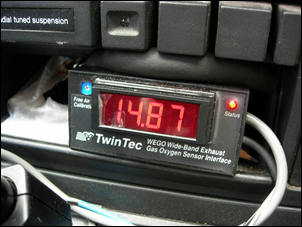 However, more and more cars use wide-band oxygen sensors that can monitor the air/fuel ratio well away from 14.7:1. In these cars, the system might still be in closed loop at air/fuel ratios of 12:1 right through to 18:1. Unless you are dealing with an older car, it is therefore no longer valid to assume that the car is in open loop when if the air/fuel ratio moves away from 14.7:1. So, why bother knowing anything about closed and open loop running? If the car’s standard air/fuel ratios are to be modified, it’s vital that the modifier know when closed loop and open loop are being used. Let’s take an example. Again, we’ll use a car that uses an air/fuel ratio of 14.7:1 at idle and in light load and cruise conditions, but richens (eg to 12:1) at high loads. Furthermore, we’ll now state that the car is in closed loop only when running the 14.7:1 air/fuel ratio – that is, when air/fuel ratios are richer than 14.7:1 (ie lower numbers), the car is in open loop. In all cases, the ECU will learn its way around these changes, reverting to an air/fuel ratio of 14.7:1. Depending on the modifications and the car, that reversion back to standard might take minutes or days. But unless the change has been so extreme that the system cannot sufficiently compensate (and such extreme changes have their own problems), the results of your hard work will be zero. On the other hand, any of the above modification approaches could be used to alter the open loop air/fuel ratio. So that 12:1 air/fuel ratio could be changed to 13:1, for example. So how do you know whether a car is in open or closed loop? 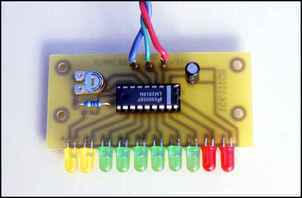 The easiest way is to monitor the output of the oxygen sensor with a simple LED meter of the sort covered at Cheaply Monitoring Air/Fuel Ratios. However, note that this is the case only for older cars that use simple oxygen sensors – that is, narrow band designs that work around 14.7:1. In these cars, the oscillating output of the oxy sensor will clearly show when the car is in closed loop – in open loop, the output will be much steadier. 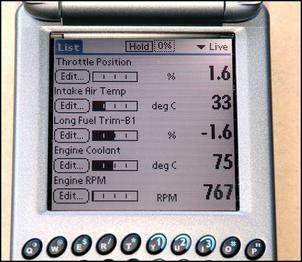 In cars with an OBD port, an OBD reader can be used to monitor the open and closed loop status – it’s normally indicated in plain English on the reader’s screen. Short and long-term fuel trims will also be shown. 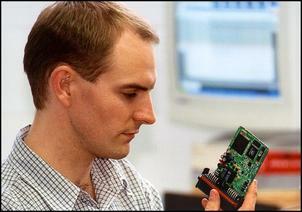 When all the factory criteria are taken into account, the air/fuel ratios set by the factory are normally best. Those criteria include emissions performance, fuel economy, road performance, reliability, manufacturing tolerances and so on. However, if you’re prepared to trade-off one aspect to better another, improvements can be made. A car that runs very rich at open-loop high loads (for example it uses air/fuel ratios in the low numbers like 10 or 11:1) can have both power and fuel economy improved if it is made leaner at these loads. The trade-off is that at full throttle the cat converter will get hotter more quickly, which in factory durability testing probably resulted in it failing. But it’s very unlikely that you’ll ever work the car hard enough to achieve that negative outcome. Another example is a car that might use an air/fuel ratio of 16.5:1 in light load, open-loop lean cruise. Changing this air/fuel ratio to 17.5:1 will result in higher emissions of oxides of nitrogen (NOx) and will also give poorer throttle response. But if you’re not unduly concerned about the increase in emissions and poorer throttle response, you’ll be able to improve fuel economy. Hell, what with the difficulty of modifying a car that’s in closed loop, and the way at least one factor will be negatively affected, why change air/fuel ratios at all? The answer is that with the right information, very good results can be achieved in personalising the car to better achieve what you want. But it’s important to realise that making modifications (eg fitting an interceptor on the airflow meter to change its signal and so improve fuel economy) is likely to be a complete waste of time as the car will be in closed loop and simply learn its way around the change. But what about changing the air/fuel ratios of the car when it is open loop? For example, what about a car that uses lean air/fuel ratios in cruise and rich air/fuel ratios at high loads – and is in closed loop only in normal light-load running? Then, there are no problems! In fact, you can go further. If the changes that are made potentially affect the air/fuel ratios across all engine loads and operating conditions, while the car is operating in closed loop, it will learn its way around these changes – but the changes may still work in open-loop! OK, so enough of the theory – let’s take a look at just such a case. Graham Pring owns a VR Holden Commodore ute, equipped with a manual 5-speed transmission and a 3.8 litre V6. To allow him to accurately monitor real-time air/fuel ratios, Graham purchased an aftermarket wide-band air/fuel ratio meter, complete with remote exhaust probe. He found that the standard car (that runs out of closed loop at high loads, in lean cruise and - very unusually - at idle) had very rich mixtures at idle (eg 12:1) while the lean cruise air/fuel ratio was about 15 – 15.5:1. In closed loop the car ran at the expected 14.7:1. Full load mixtures at 2000-3000 rpm were 12.3 and 12.7:1, respectively. The aim was to improve open road fuel consumption; the standard consumption over 270 km of variable country road was 7.65 litres/100km. The factory Bosch 0 280 150 960 injectors were swapped for slightly smaller Pintara 2.0 litre 4 cylinder 0 280 150 702 injectors. These cost $65 for the six. Holden JE Camira 0 280 150 725 injectors were about the same price and also had very similar flow. With either the Pintara or Camira injectors in place, the cruise air/fuel ratio leaned to 15.3 – 15.7:1. Country road fuel economy improved to 7.36 litres/100km. Next up were still smaller Volvo 240/740/940 injectors - Bosch 0 280 150 762. These gave a lean cruise air/fuel ratio of 15.9 – 16.3:1 and country fuel economy improved to 6.95 litres/100km. That’s a measured country road fuel economy improvement over standard of 9 per cent! With these injectors in place, the idle air/fuel ratio leaned to 13:1 (still very rich for idle) and the full-load mixtures moved to 12.7 - 13:1 – still fine for high loads in a low-stressed engine. Graham says that with these changes, driveability remained factory; he’s now experimenting with further injector swaps, and also reducing fuel pressure. It’s easy to think of a myriad of ways of leaning the air/fuel ratio to improve fuel economy – but the trouble is, most of the time the changes will be ineffective because the car is in closed loop. Therefore, the first step is to ascertain when closed and open loop conditions occur, and then make changes that will not be ‘learned around’. Also keep in mind that there will always be other trade-offs – in emissions for example. As Graham Pring has shown, in some cars, changes that result in leaner mixtures can give measureable improvements in fuel economy – but it’s certainly not the simple step that it initially appears. 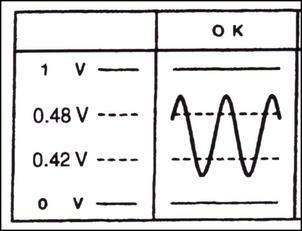 If the signal from the oxygen sensor can be intercepted, the air/fuel ratios can be changed in closed loop operation. However, while it sounds easy, this isn’t necessarily the case. As indicated in the main text, narrow-band oxy sensors switch in output around 14.7:1. This ‘switching’ characteristic is part of the design of the sensor – the switch point is chemically and electrically fixed. 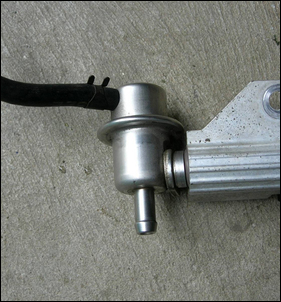 Instead of an oxygen sensor, think for a moment about a temperature switch – one that switches at (say) 80 degrees C. You can immediately see that whatever you do with the output signal from the switch, you can’t change the temperature at which it switches. Now the switching point of an oxy sensor is not quite as on/off as a temp switch, so some fiddling with the signal can be done at the edges of the sensor response. However, despite plenty of people suggesting that a narrow band oxy sensor response can be tweaked, we’ve never seen this achieved in a meaningful way – eg a change of closed loop air/fuel ratios from a steady 14.7 to (say) an equally steady 15.5:1. So while we say that it’s not impossible to modify narrow band oxy sensor outputs, we don’t think it’s anywhere near the doddle that some suggest. In fact, while people gasp at the notion, we’ve achieved much better results by permanently disconnecting the oxy sensor and then tuning the mixtures with a good airflow meter interceptor. We’ve even passed a roadside emissions test in a car using this approach. However, a fault code will be registered (ie ‘check engine’ light will be on) and in some jurisdictions, this approach may be illegal.